We’ve hit that point in the year when corn is a topic of family conversation. While we happily graze on corn, we figure out whether the guy in the old wal-mart parking lot has better corn than the guy in the church parking lot (church parking lot for the win). We talk about the flavor,size, and color (Peaches and Cream all the way). We talk about the best way to eat it (just a little butter, salt, and pepper). I’m actually the oddball in the family. I’ll eat corn straight off the cob but I would much rather create meals around it. I love this vegan roasted corn chowder and these corn and cream cheese baked potstickers are drool worthy. Give me good sweet corn during July and I won’t ever let it got to waste. Enchiladas are also one of my favorite meals to make for guest. I whip up everything the day before and all I have to do the next day is bake. Perfect for when your trying to entertain and don’t want to be stuck in the kitchen. I also have to say that if you make your own corn tortillas, this dish is taken to an extra level of awesomeness. Everything comes together just right. This recipe can easily be adapted for whatever you have on hand. I think the addition of some sautéed jalapeños would be a great addition to the filling and the sauce can be adjusted to your liking of spiciness-just adjust the amount of chipotle powder you use. I also recommend that if you are using corn tortillas, make a large batch and freeze any extra for more taco/enchilada making. Carefully remove corn from cob by placing the cob perpendicular to the bottom of a large bowl. Cut downward on the cob. Toss kernels with 1/2 tablespoon olive oil and 1/8 teaspoon salt. Roast, stirring occasionally, until soft, 15-20 minutes. In a medium bowl, whip together ricotta, honey, lime juice, and cilantro. Once corn is done, stir into ricotta mixture. To make sauce, heat 1 tablespoon olive oil over medium low heat. Add in minced garlic and saute for 1-2 minutes. Roughly dice tomatoes and add into pot along with chipotle powder and salt. Cook until tomatoes are starting to break down. Remove from heat and blend with an immersion blender or a regular blender. Layer tortillas in between a damp towel and either place in the microwave or oven oven for a couple minutes until pliable. 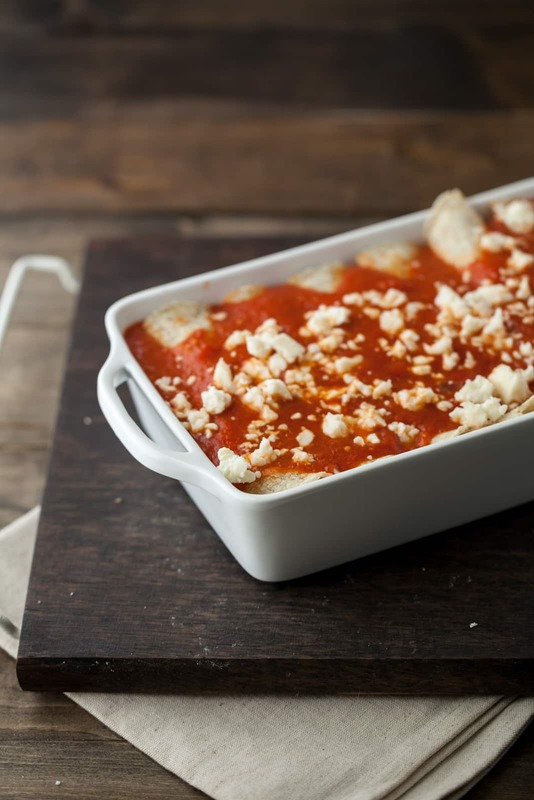 To assemble enchiladas, use and 8×5 pan (or an 8×8 with extra space). Place 1/3 of the chipotle tomatoes in the bottom of the pan. Next, scoop 1/3-1/2 cup corn filling in to the center of the tortillas, roll gently, and place seem side down in the pan. Repeat with remaining tortillas, carefully squeezing the last tortillas in. Pour remaining sauce on top and sprinkle over queso fresco cheese. Bake enchiladas until lightly browning and bubbly, 20-25 minutes. *If you want to fill an 8×8 pan, simply make the filling by 1 1/2 (3 ears of corn, 1 1/2 cups ricotta, etc). The normal sauce amount with work and just use 10-12 tortillas. I’ve never warmed to enchiladas mainly, I think, because the ones you get in this country are so terrible. This has given me a completely different perspective! I love corn; the summer is when it really has its day! I like you make meals around those little sunshine colored gems; but eating it off the cob also feels so quintessentially summer. This recipe looks great; I would even make this now, freeze it and enjoy the taste of summer in the fall! OOH! 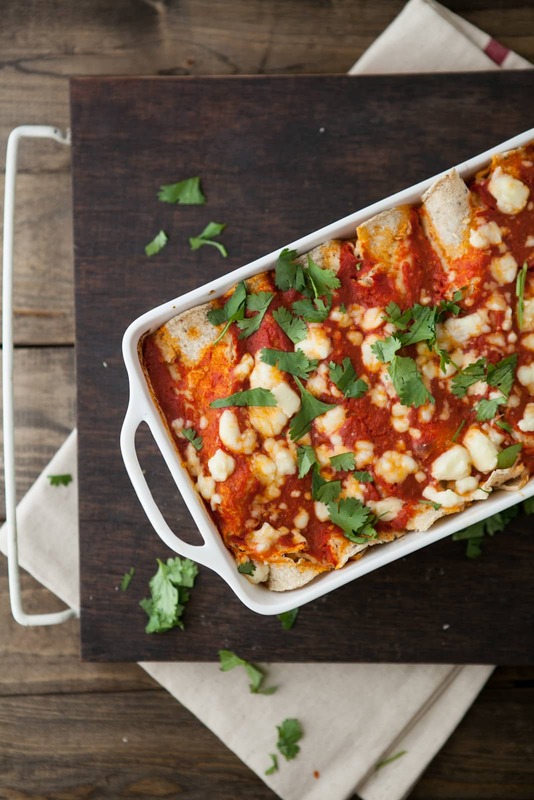 These enchiladas look like the perfect summer feast. I might have to sub in some beans for the ricotta so my dairy-intolerant spouse can eat it, though…or maybe I’ll just make a little tiny batch for myself! I’ve never considered using ricotta in a Mexican application like this. What an interesting idea. I just pinned it to save for later! Excellent job with your E-cookbook, the pictures are gorgeous and the recipes look deee-lish!! You never disappoint and I just love your blog! These look amazing. Just discovered your blog and am finding some great recipes for my new(ish) vegetarian diet. I made these for a potluck yesterday and they were a huge hit. Fantastic! Yes! So glad everyone liked them! I made these tonight and they were fabulous! I LOVE your blog! I’ve made enchiladas a few times using the Old El Paso kits and an onion and pepper filling but these are so much better! 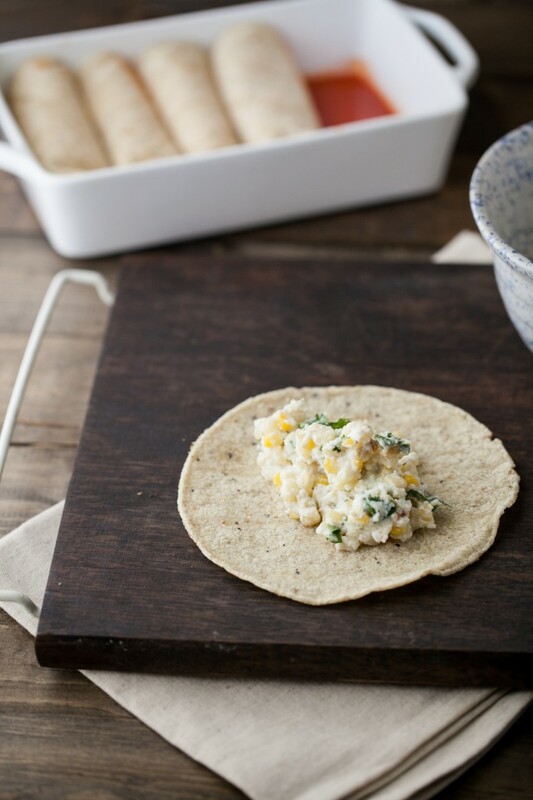 The sweetcorn is crunchy, the ricotta is creamy and the chipotle flavour is smoky and gorgeous. I couldn’t get hold of chipotle powder (must be because I’m in the UK) but I used Wahaca Chipotle sauce instead, just a couple of drops. For those of you who don’t know – Wahaca is a Mexican street food restaurant chain that has recently begun stocking its table sauces in supermarkets in the UK. I think the sauce worked perfectly in this dish, as did Feta cheese sprinkled on top (again, I was unable to source Fresco cheese in the UK but I believe they’re quite similar!). I used Sweet Antonio tomatoes for the sauce and didn’t bother blitzing it and I quite liked the chunkiness and texture of the tomato skins. I also used defrosted cilantro/coriander which saved buying it fresh. Overall, an absolute treat for any veggie craving a delicious twist on traditional Mexican eating. Love it! I have included this in my June Real Food Meal Plan post. Thanks for sharing! This recipe is really great! I’ll definitely be making these again (with some additions)! I made these with homemade tortillas and they were really incredible! Everyone loved them. Perfect combo of flavors and textures. Hi Erin. This was delicious! 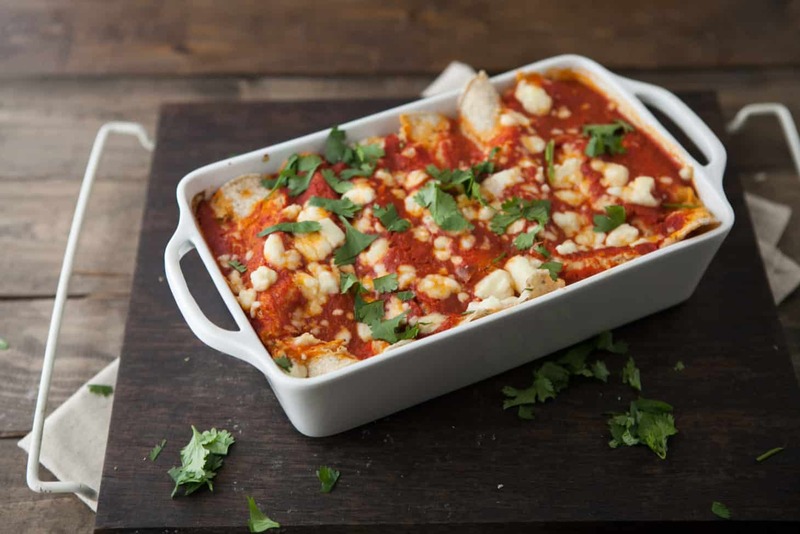 Could I use tomato pasta sauce that I have canned for the enchilada sauce? Always happy to find a new entree recipe for our vegetarian meals. this one is a winner. 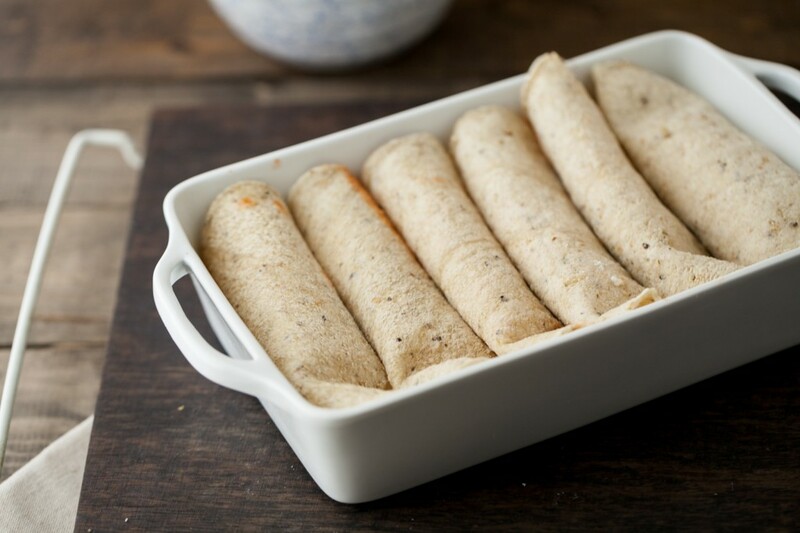 I make my own tortillas so they are especially tender enchiladas.